This lovely boxed gift set is perfect for taking along with you on a vacation when you want to really treat yourself. The experts over at K. Hall Designs have created these wonderful formulations for their Barr Co division, and with this boxed set you get four 2 oz bottles, with body lotion, body wash, shampoo, and conditioner. 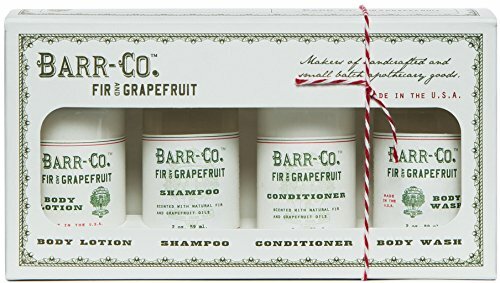 They are formulated with plant derived ingredients, and the The Fir and Grapefruit scent by Barr Co is amazing! What could be better than juicy grapefruit zest combined with the clean, fresh, and woodsy notes of fir oils. It combines to create an intense rush of invigorating, yet comforting scents. This collection is made with vegan ingredients and features natural plant extracts and soothing botanicals. Made in the USA by Barr Co, a division of K. Hall Designs. If you have any questions about this product by Barr Co, contact us by completing and submitting the form below. If you are looking for a specif part number, please include it with your message.